Facebook will soon have a Dislike button to sit alongside its ubiquitous Like button Facebook Likes Update: Everything You Need To Know Facebook Likes Update: Everything You Need To Know Did you just notice a big change in your page's follower count? That's not a bug—it's a feature. Here's what that means for your page. Read More . Facebook founder and CEO Mark Zuckerberg announced the news during a Q&A session at Facebook HQ. 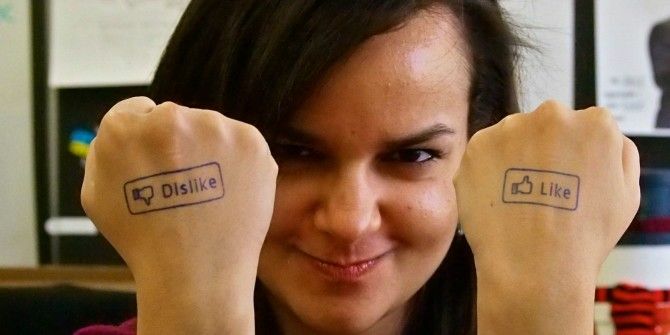 Facebook has apparently been working on a Dislike button for some time Zuckerberg Dislikes Facebook Dislikes, Ed Sheeran Praises Spotify [Tech News Digest] Zuckerberg Dislikes Facebook Dislikes, Ed Sheeran Praises Spotify [Tech News Digest] Also, Lenovo recalls cables, the Xbox One beats the PS4, Spotify listens to your friends, and Star Wars fan reacting to the new trailer get parodied. Read More , and it’s “very close” to being rolled out. According to Business Insider, Zuckerberg stated, “People have asked about the dislike button for many years. Probably hundreds of people have asked about this, and today is a special day because today is the day that I actually get to say we are working on it, and are very close to shipping a test of it”. However, this may not be a Dislike button in the sense we’re all imagining. Zuckerberg made it very clear he doesn’t want Facebook to devolve into upvotes and downvotes, suggesting this will be more about expressing empathy. Because we really do need an alternative to Liking a status update about someone passing away, being ill, or getting divorced. Snapchat has released an update to its apps, adding the option to pay to replay Snaps, a new feature called Lenses, and virtual Trophies. All of which should help Snapchat grow even bigger 7 Reasons Snapchat is a Teenager's Favourite Social Network 7 Reasons Snapchat is a Teenager's Favourite Social Network The latest craze amongst the adults of the future is the secretive photo-sharing service Snapchat. Why do they love it? Read More and make some money in the process. Which is an essential step for any popular free app. Snapchat Replays are available to all U.S. users willing to pay for the privilege. Paying 99 cents buys you three replays of individual Snaps, but you can only replay each one once. Users have been able to replay one Snap every day for a couple of years, but this monetizes the whole thing. Lenses is a way of augmenting selfies being taken through Snapchat. Users bored of regular ol’ selfies 5 Things To Avoid When Taking Selfies 5 Things To Avoid When Taking Selfies Selfies shouldn’t be taken lightly, and there are many things you need to avoid. Read More can choose filters to distort or age their faces, or add animations and/or sound to turn them into something else altogether. Trophies rewards users for using the app, awarding virtual goodies for achieving certain accomplishments. This is simply a form of gamification Why Gamification Is Not The Magic Bullet Everyone Thinks It Is Why Gamification Is Not The Magic Bullet Everyone Thinks It Is Gamification is spreading across the web like a plague, as if slapping on a few badges and leaderboards is enough engage users. The truth? Gamification can harmful. Read More , which is designed to encourage users to use the app more regularly and in new ways. Sony has renamed its forthcoming virtual reality headset, turning Project Morpheus into PlayStation VR. The company made the announcement during the 2015 Tokyo Game Show, and released the above video to show what it hopes the final experience will be like Why Virtual Reality Technology Will Blow Your Mind in 5 Years Why Virtual Reality Technology Will Blow Your Mind in 5 Years The future of virtual reality includes head, eye and expression tracking, simulated touch, and much more. These amazing technologies will be available to you in 5 years or less. Read More . Sony executive Masayasu Ito said, “The name ‘PlayStation VR’ not only directly expresses an entirely new experience from PlayStation that allows players to feel as if they are physically inside the virtual world of a game, but it also reflects our hopes that we want our users to feel a sense of familiarity as they enjoy this amazing experience”. Unfortunately, while the branding has been finalized, there was no word on either a release date or a price, so we still don’t know when to expect this VR hardware Project Morpheus Vs. Oculus Rift, Unreal Engine 4, Flappy Bird Returns [Tech News Digest] Project Morpheus Vs. Oculus Rift, Unreal Engine 4, Flappy Bird Returns [Tech News Digest] Project Morpheus and Oculus Rift bring virtual reality back, Unreal Engine 4 debuts, Flappy Bird is returning, Firefox 28 drops Metro, Google Docs phishing, and Mongolia tries to ban swearing on the Web. Read More or whether we’ll be able to afford it. Still, PlayStation VR has got quite a ring to it, so that’s a good start. Square, one of several ways of sending money to friends The 6 Best Apps to Send Money to Friends The 6 Best Apps to Send Money to Friends Next time you need to send money to friends, check out these great mobile apps to send money to anyone in minutes. Read More , just made it easier than ever to donate to politicians, if you’re that way inclined. Square has teamed up with Twitter to enable politicians to beg their followers for more money. Anyone gullible enough to do so simply has to reply to the tweet with their debit card number and some extra information. It will come as no surprise to learn that 12 Presidential hopefuls 10 Opinionated Political Commentators To Follow On Twitter During 2012 U.S. Presidential Election 10 Opinionated Political Commentators To Follow On Twitter During 2012 U.S. Presidential Election It's hard to believe that it's been almost four years since Barack Obama entered the White House. The next U.S. election, to be held this November, will see President Obama going up against his opponent,... Read More have already signed up to use these Cashtags. And finally, Rockstar Games The 8 Best Rockstar Games Of All Time The 8 Best Rockstar Games Of All Time Rockstar Games is more than just Grand Theft Auto, and its back catalog of titles deserves a closer look. What follows is a list of the best titles Rockstar Games has released so far. Read More really isn’t happy with the BBC right now, as the tweet embedded above proves. The reason? The BBC (British Broadcasting Corporation) has aired a docudrama called The Gamechangers, showing how the Grand Theft Auto series came into being. The problem, at least as far as Rockstar is concerned, is that The Gamechangers bears little resemblance to fact. Making it more drama than documentary. Still, The Gamechangers is currently available to watch on iPlayer, for those either in the UK or using a VPN 8 Instances You Weren't Using a VPN but Should've Been: The VPN Checklist 8 Instances You Weren't Using a VPN but Should've Been: The VPN Checklist If you haven't already considered subscribing to a VPN to secure your privacy, now is the time. Read More (Virtual Private Network). Do you like the idea of a Facebook Dislike button? Would you ever pay to replay a Snapchat Snap? Are you excited at the prospect of using PlayStation VR? To which politician are you most likely to donate money? Have you watched The Gamechangers? If so, what did you think of it? Explore more about: Facebook, PlayStation 4, Snapchat, Virtual Reality.